The Japanese cabinet officially recognised this week that Japan's economy has entered its first recession since 2001, following a second quarterly contraction in Q3 2008. Claus Vistesen has already analysed (in this post) the key issues which lie behind the present recession data, and has also, in this post today, attempted to place Japan's renewed deflation alert in a somewhat broader context. Thus I will limit myself here to looking at the basic GDP data, and the export developments which accompany it. Japan's gross domestic product shrank by an annualised 0.4 per cent in the three months to the end of September, following a revised decline of an annualised 3.7 per cent in the second quarter, according to data released by the cabinet office on Monday. It is quite possible that we will now see a third consecutive quarter of contraction in the October - December period, especially if October's export performance (see below) is anything to go by. Quarter-on-quarter, Japan's economy shrank 0.1 percent, lead by a 1.7 percent drop in capital spending. 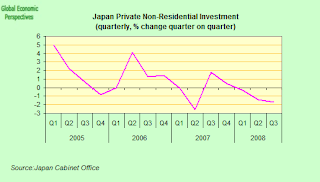 In fact, as can be seen in the chart below, Japanese investment has now been dropping back steadily since the third quarter of 2007. Net exports also weighed on growth - subtracting 0.2 percentage point from growth after imports outweighed an increase in shipments abroad. Exports were up 0.7 percent, while imports climbed 1.9 percent as oil surged to a record in July. Consumer spending, on the other hand, increased by 0.3 percent, a much better showing than the one achieved in the second quarter, when consumption declined a quarterly 0.6%. Year on year, household consumption dropped back from 1.7% growth in the first quarter to 0.4% in the second quarter and 0.3% in the third one. The rapid decline in the Japanese economy’s fortunes has pushed the government of prime minister Taro Aso into introducing a Y5,000bn ($51bn, €40bn) stimulus package, despite the mounting debt of the Japanese government, while the Bank of Japan has been forced to desist for the time being from its monetary "normalisation" programme, and has but the monetary vehicle in reverse gear by once more cutting interest rates -on this occassion for the first time in seven years. The cut - which was by 20 basis points - took BoJ interest rates to 0.30 per cent, meaning that during the longest economic expansion in recent Japanese history the bank was only able to raise rates by 0.5% during the upswing, and we now eagerly await to see what it will be capable of during the downcycle. 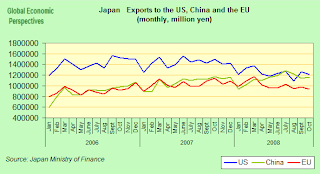 In any event neither the fiscal stimulus nor the monetary easing are likely to be of great impact since Japan's economy is export driven and it is the downturn in demand in the US , Europe, China, Russia and elsewhere, and the consequent battering of Japanese exports, which has lead to the recent strong decline in investment and consumption. 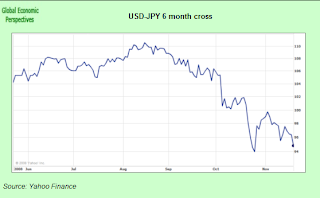 Meanwhile the unwinding of the carry trade has pushed the yen up, and the currency has gained some 9.4 per cent vis a vis the dollar since the end of September (see six month chart below), only adding to the difficulties faced by Japanese exporters as their goods become more expensive for overseas buyers. The Tokyo stock market has also fallen 44 per cent fall this year, depressing consumer sentiment, while bankruptcies in October hit a 2008 peak of 1,429, according to credit reference agency Tokyo Shoko Research. And we should not imagine that the current recession is likely to be short lived one, since we are going to have to learn to live with the current problems for most of 2009 at least, an outlook which has also been endorsed by Japan's economy minister Kaoru Yosano, who warned last week that the next fiscal year (starting in April 2009) was likely to continue to register negative growth for the economy. "I can hardly be confident that it would be positive," he told a news conference. And the present contraction only looks set to deteriorate in the fourth quarter with Japan posting a Y63.9bn trade deficit in October, reinforcing concerns that falling exports will push the country even deeper into recession. In fact Japan's exports declined at the fastest pace in almost seven years in October as sales of cars and electronics slumped. Exports fell by 7.7 percent from a year earlier, which was the biggest drop since December 2001, according to the Finance Ministry. The monthly report showed just how the global financial crisis is hurting demand from emerging markets, which up to now have helped prop-up Japan's export growth as shipments to the U.S. and Europe have waned. Not surprisingly - since Europe is in recession - shipments there plunged an annual 17.2 percent, the largest drop since December 2001, while demand from the U.S. dropped 19 percent. But even exports to Asia were down (byan annual 4 percent) while shipments to China fell for the first time in three years. 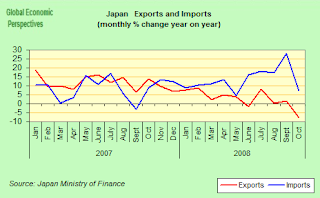 We should, however, bear in mind, that these figures are to some extent influenced by the yen value of the export shipments, since euro and dollar denominated prices will have registered lower readings when converted back into yen, due to the sharp and sudden rise in the yen in mid October, which could hardly have been anticipated at the time of planning shipments. 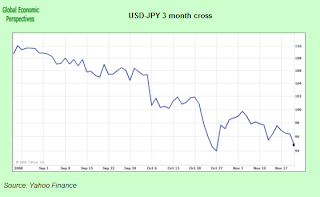 So yen fluctuations may make the October numbers look worse than they actually are in volume terms. Imports, on the other hand, were up 7.4 percent on the year, and this produced the trade deficit of 63.9 billion yen ($666 million), the third shortfall so far this year. Both the U.S. Federal Reserve and Bank of Japan officials now openly admit to being on active alert for the early signs of deflation, and both are actively grappling with the thorny problem of just how to continue to keep it at bay as interest rates steadily approach zero (well, truth be said, in the Japanese case they never moved too far away from it). There are growing signs that the Federal Reserve may have already resorted resorted to some form of quantitative easing - a procedure that relies more on massive liquidity injections into the banking system than it does on the more conventional key policy-rate-driven monetary tools. But while Bank of Japan Governor Masaaki Shirakawa accepted that just such injections had helped stabilise (but not cure) Japan's decade long deflation problems, he declined to comment on whether or not it would currently be the best response to the economic downturn in Japan. As Claus indicates in his accompanying post, central bankers who only few months ago were struggling to contain an inflation flare-up stoked by soaring commodity prices are now desperately trying to prevent the global market rout from degenerating into a cycle of falling prices and economic output. Consumer demand is falling sharply across most of the industrialized world and U.S. while consumer prices fell at a record pace in October. The Fed and other central banks are already flooding the banking system with cash in an attempt to prod banks into lending to each other, but the funds supplied are still lent at a some sort of notional cost (however low). In Japan, during the period of quantitative easing from 2001 to 2006, banks received cash free (although during deflation since prices drop, the value of money paradoxically rises) in the hope that it would spur credit growth and consumption. But the Bank of Japan is being much more cautious at the moment about what the best policy to tackle deflation actually is, and for the moment are relying on interest rates being held at 0.3 percent. Bank governor Shirakawa said on Friday that in his mind further rate cuts might do more harm than good by further disrupting markets. He was also pretty non-committal about a return to quantitative easing. "The BOJ decided to implement quantitative easing in the past because it was appropriate to do so in light of economic developments at the time," he said. "As for what would be the best policy in the future, we will decide by examining economic and financial developments." When asked about the risk of falling prices, Shirakawa said: "Now that raw material costs are falling, a key factor to watch is whether that would cause a knock-on effect and push down overall prices." "We will closely watch the balance of domestic supply and demand and how people's price expectations develop". 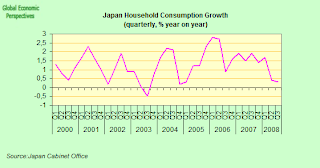 However, with Japan's economy already in a recession and oil and commodity prices in sharp retreat, it looks very probable that core core consumer prices will start falling again either in December or early next year, at which point the Bank of Japan will have some serious thinking to do. In the meantime, as always, we watch and wait. Today it is precisely one month since yours truly first reported that he was starting to feel swamped. Well he still is, but even though your author is still struggling to meet the quantitative demands of neo-classical graduate economics (especially, the statistical vintage) he still thinks that now might be as good a time as ever to jump back into the saddle and practice some economic punditry. After all, this is something he, much unlike graduate econ math, is quite familiar with.Needless to say, it is difficult to know where to start but since I am only now returning from an extended pause it might a good idea to pick up one of the themes I laid out just before the anvil of quantitative science hit me. Consequently, one thing that I have been persistently noting in my ongoing analysis of the global economy has been the risk of deflation in key economies due to the dramatic decline in domestic demand and credit momentum. Specifically, I have been warning that when it comes to the old economies of the world (measured by median age) the risk of a deflationary backdrop is particularly large. The argument here is really quite straight forward in terms of economic dynamics and basically hinges on the idea that relatively old economies do not have sufficiently dynamic internal demand conditions to prevent their economies from falling into deflation. Obviously, the risk of deflation can hardly be confined to these economies at this point and what we are facing now is a potential scenario of global deflation both in terms of core and headline prices as well as of course asset prices. At least I would say without sounding too doomist that this is now a real threat. Deflation Coming to a CPI Near You? A couple of months back I sketched my thoughts on the topic as I asked the simple question of whether deflation would be the next macro story. As the carnage in global finance continues and as the effect on the real economy is increasingly making itself felt I am sure most analysts and observers feel a bit shell shocked. I know that I do. Consider consequently the recent news that consumer prices in the US fell a whopping 1% on a monthly basis which more than suggests how the threat of deflation is mounting. Of course, the monthly decline in consumer prices masks a healthy y-o-y growth rate of some 3.7% (2.2 in core prices) which does not exactly spell deflation in any sense of the word. However, the negative momentum must be considered here and in particular the fact that the global economy has gone from a situation of liquidity disruptions confined to the wholesale banking market, over to a severe credit crunch in terms of firms operational finance and on to what must now be considered a complete freeze of lending to all agents. On the back of the recent barage of execrable news from the US, JPMorgan rolls out the inevitable prediction that the Fed and Bernanke may even introduce some form of ZIRP to counter the recession. And speaking of ZIRP we learned yesterday from Japan how exports sank the fastest pace in seven years which also prompted analysts from Barclays to suggest that Japan would return to deflation and that the BOJ would have to re-introduce ZIRP accordingly. I don't know whether the good lads at Barclays had to dig deep to come up with this call; needless to say that deflation in Japan is now a foregone conclusion as we venture towards 2009 and the previous sharp dose of cost push inflation tapers off. At the BOJ, rates were kept at the odd 0.3% yesterday and while there may be an strong inclination not to cut rates to 0% for simple reasons of credibility I do think that they will have to bite the bullet as we move forward into this slump. In a general global context, I think it is important to recognise the massive negative shock we are seeing on demand conditions in those nations who have hitherto been living high on credit and since the credit channels are now firmly broken, so will those macroeconomic credit providers (read: exporters) also suffer .The epitomy of this must clearly be Japan but also Germany comes immediately to mind. And now that I am talking about Europe, the deflation ghost is also here hovering like a dark shadow over the economic edifice. Of course, and as a hell of a lot more than the proverbial Rome is burning I am not sure what the ECB will do here? 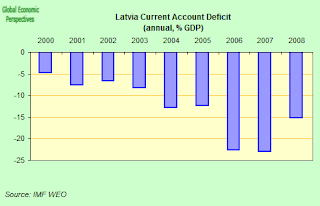 It is true that it seems that European policy are content with flexing their fiscal muscles while Trichet et al. remains in the ivory tower where the M3 presumably is still growing above target and where only a definitive drop in consumer prices below 2% would seem to allow the ECB, in a postmortem perspective, to really act along the lines of its other CB peers. At this point I will give the ECB the benefit of the doubt in the sense that we have indeed observed a real change of strategy, but given other CBs' response the ECB seems still, to be the odd man out. That may change quickly though. The Spanish representation at the ECB roundtable certainly seems to be predicting a dire potential outcome which, given the state of things on the Iberian peninsula, it is difficult to second guess. European Central Bank council member Miguel Angel Fernandez Ordonez forecast an ``enormous'' drop in euro-region inflation. Bank of Spain forecasts for the 15-nation euro area ``show an enormous moderation in price gains, but they do show price gains,'' Ordonez, who is also governor of the Spanish central bank, told reporters in Madrid today. The forecasts ``don't show deflation,'' he said. As in the US we are far from an actual state of deflation, but given my argument as I laid it out (see link above) the negative momentum we are observing suggests that what comes next on the macroeconomic front may be quite "unexpected" as those ever incoming stream of Bloomberg headlines are so fond of noting. If we look at the evolution of data the interpretation is quite clear. As can be seen from the graphs below, the decrease in inflation is currently being produced solely as a function of declining headline inflation (this is the same picture as the one emanating from the US and Japan). More generally, it is hard not to think back to the days when Trichet was playing tough on inflation, when CEE central banks revalued as there was no tomorrow, and where moral hazard (or traitor?) was pinned on all those who had the temerity (I positively love that word!) to argue that something had to be done. 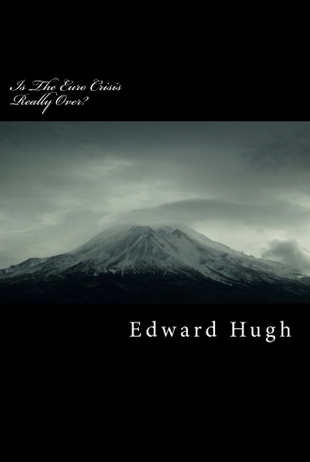 Clearly, we are past that now and to steal again the analogy conjured by my colleague Edward Hugh; what is the point in having your throat slit alongside your enemy's just to see who can run the fastest before bleeding out? Clearly, not the most productive of endeavors I would say. 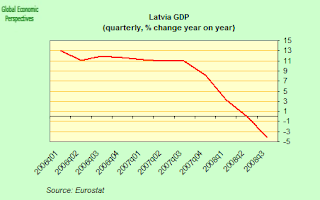 Meanwhile and returning to the graphs one last time it seems as if, once again, one of Macro Man's metaphors will be useful; more specifically I am talking about the one in which Trichet does the humpty dance (now, there is a party I would attend!). Do you see a hump sir? I do. Obviously it is never so simple. First of all there is the good old sticky price phenomenon which is also present in the graphs where headline (cost-push) inflation is coming down rapidly but where core inflation naturally will need more time before adjusting to the economic fundamentals. In this way, and if we pull out the oldie but goldie dichotomy between the Anglo-Saxon and Continental European economies conventional wisdom would have it that prices (and wages) adjust more more slowly in the latter. In some ways this would merit the divergence between the Fed and the ECB in tackling this mess. However, I am not sure such MD/SAS analyses apply in this case. More specifically, what I am looking for in particular is what will happen in the transition as many economies now will need to depend more on external demand to achieve growth. Remember here that all those rescue packages need to be paid for and domestic demand in itself will hardly do it. For the US et al. a reduction of external imbalances will be of material importance. Thus, I am also sure that we have the whole rebalancing/global imbalances discourse knocking around somewhere in the background. Yet, I am just not sure that the ECB can "help" the US by keeping interest rates up and by derivative "offering" the Eurozone as a shoulder on which the global economy can lean for demand. Add to this of course that the market has already discounted the incoming recession through the absolute slaughter of the EUR/USD. 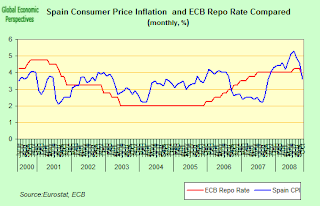 In this sense the ECB may get double pinched since if they lower rates further (and one has to assume that they will) it COULD take the Euro to a level where the objectives of policy would be in conflict in the sense that rates would have to be kept higher than otherwise to avoid the Euro to fall in the .9-.8 region. In some ways, this is would square well with the likely growth path of the "future" Eurozone as an economy driven less by domestic demand than has hitherto been the case. And yes, you heard me right, there will be much less domestic demand to go around in the Eurozone and indeed the entire EU 27 once the corrections in Spain and Eastern Europe becomes clear for everybody. And thus we end up at one of my favorite hobby horses (I have several). In a world where governments are presiding over ageing populations and faced with a major overhang of debt in the context of fighting this behemoth of a financial crisis, the incentive to try to burn up the debt through inflation (and for all things in the world, to avoid deflation) and thus by derivative export your way out of trouble is massive. I would hold this to be true even without the particularity of the current situation in the sense that as the world ages so does the number of economies dependent on external demand grow. In fact, it is precisely this "incentive" to be export driven I think it is so crucial to pin down in both a practical and theoretical sense, but that will have to wait for another day. While we are likely to see a "substantial'' drop in euro-region inflation, Bank of Spain forecasts for the 15-nation euro area do not show price drops. That is they "show an enormous moderation in price gains, but they do show price gains,'' according to the latest statements by Miquel Angel Fernandez Ordoñez, ECB Council member and Governor of the Bank of Spain. Bank of Spain eurozone forecasts "don't show deflation" he told reporters in Madrid yesterday (Wednesday). The reason for this swift and adroit response to the question of the day in Spain was that EU Economy and Finance Commissioner Joaquin Almunia (not exactly your garden-variety world authority on macroeconomic topics) had earier said that the Europe's economies were "facing the prospect of deflation" amidst the worst financial crisis since the 1930s. In fact Fernandez Ordoñez is right, as is his want - right on a technicality. The Eurozone as a whole is almost certainly not heading straight into deflation (yet), but this begs the question which he could have been answering: what about poor little Spain? As I reported last week, Spain's consumer price index has now been dropping since June (see chart below), and it is very possible (I would say probable) that the index will move in negative territory throughout 2009 (and possibly by between 1 and 3 percent). True a significant part of the drop at this point is due to the drop in energy costs, but even the core-core index (excluding energy and fresh vegetables) was only up around 0.4% in October (HICP) over June, or an annual 1.2% rate, and it is my very very strong opinion that we will start to see "downwards pass through" as the recession deepens, profits melt (rather than just being squeezed) and everyone struggles hard to try and find a bottom. 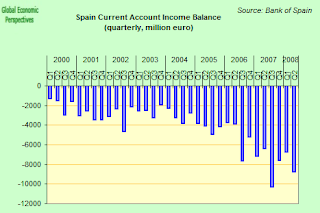 According to data from the National Statistics Institute earlier this week, Spanish household spending contracted 1 percent in the third quarter of 2008 over the previous quarter, while investment contracted by 1.9%. 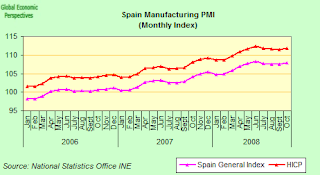 We can only realistically expect this process to continue during 2009 and unemployment to continue to rise, creating a considerable capacity overhang which will exert a downward pressure on wages and prices (remember around one third of new employment contracts in Spain are temporary, making salary reductions comparatively straightforward, at least for one part of the labour force). Meantime in the United States the Federal Reserve has been busy stressing that it will do whatever it has to do to ensure the US does not fall into a deflation trap. This view was reinforced by statements from vice-chairman Dohn Kohn yesterday (Wednesday), as US stocks fell below 8,000 on the Dow Jones Index (their lowest level so far in this financial crisis) and consumer prices fell 1% in October when compared with November. That was the largest monthly drop in at least 61 years (since the current index only goes back to 1947). Even core consumer prices, which exclude food and energy, fell by 0.1 percent month on month, and this was the first monthly drop in core prices in more than a quarter of a century. Don Kohn stressed he did not believe deflation was the most likely outcome for the US economy, but he did say he thought it was a “less remote” possibility than he previously thought. The lions share of the fall in headline inflation, of course, came from energy prices dropping 8.6 per cent. Yesterday crude oil fell to a $53.30 a barrel, its lowest since January 2007. Treasury inflation-protected securities now indicate that investors anticpate deflation in the US, though Fed officials stressed in interpreting the data that prices were being distorted by a lack of liquidity. The five-year break-even rate, which provides an expectation of future inflation, currently suggests that investors expect annualised inflation at a minus 0.70% rate over the next five years. It is also worth noting that it is getting much more difficult to read Fed policy intentions, at least as far as movements in the key policy rate go. Massive injections of liquidity have now driven the interbank overnight lending rate to less than half the current 1% Fed FOMC rate. The presence of this gap seems to be now shifting investors' focus toward the amount of money in the banking system as a better gauge of Fed intentions than possible movements in the policy rate. Kohn in fact stressed that the US central bank is simultaneously reducing interest rates and expanding its balance sheet (in a process known as quantitative easing) and explicitly avoiding reliance on one strategy "in favor of another". Analysts point to the surplus cash that banks keep on deposit at the Fed as an important gauge of the Fed's true monetary-policy stance. These so-called excess reserves have ballooned to $363.6 billion from $2 billion in August as the Fed has added one measure to another in its emergency lending program package. Excess reserves are now bigger than the overnight lending market between banks (aka the federal funds market), but it is in this market thatthe Fed sets its key rate target. As a result of the large volume of excess liquidity it is becoming more and more difficult for Bernanke to control the federal funds rate (he recently described it to the House Financial Services Committee. as an issue he was "working on") - and the effective federal funds rate was 0.38 percent Novber 18, and has averaged 0.29 percent since the Federal Open Market Committee cut the rate to 1 percent on October 29. Former St. Louis Fed President William Poole has described this as a move to quantitative easing, a process which forces a large volume of reserves into the banking system with the expectation that banks will start to trade them for a higher-yielding asset. Such quantitative easing in fact formed the backbone of the Bank of Japan anti-deflation stance between 2001 and 2006 (as in the case of the Fed, it was this easing rather than the more headline catching ZIRP - zero interest rate policy - which was doing the bulk of the donkey-work), but it is worth noting that while this policy stabilised Japan's situation temporarily, the Japanese economy never actually came out of deflation (at least as far as the core core index goes) and now once more under the grip of recession it seems almost certain to fall back even further into negative price territory. The basic problem is that the banks themselves may well fail to freely lend the excess reserves to businesses and consumers, in the process prolonging the credit freeze. That is basically the underlying story of what actually happened in Japan. Normally, when central banks launch explicit quantitative easing strategies they abandon the interest-rate target and start purchasing assets in order to boost the money supply. This is what Bernanke calls "expanding the Fed's balance sheet". Typically, such activities can have two effects on an economy. In the first place banks can decide to earn more than the nominal rate they earn at the central bank and start to lend aggressively. We have seen no signs of this happening as of yet, and measures of bank reserves are growing faster than most money supply measures. Secondly, the central bank can target some assets that are thought to have a broad impact on the economy, such as Treasuries or mortgage-backed bonds. The US Federal Reserve has already taken a half-step in that direction by purchasing the commercial paper of U.S. corporations at predefined rates. The central bank's Commercial Paper Funding Facility held $256.1 billion as of November 12. 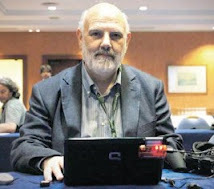 Basically returning to the issue at the start of this post concerning Miquel Angel Fernandez Ordoñez's statement on deflation, we should not take everything here at face value. Communicational techniques are different between one side of the Atlantic and the other, and we might note that even Don Kohn says that he doesn't consider deflation a "likely" outcome (he couldn't very well say so, could he, as saying it was likely would be like saying in advance that it wasn't very probable the Fed's preferred policy option would work, and this he isn't going to say, even if he has serious concerns about effectiveness). By the same token all Fernandez Ordoñez has really told us is that the Bank of Spain forceast isn't currently showing price falls in 2009 (and I am sure it isn't) but only a pack of fools would draw the conclusion from that that they should have no "plan B" for deflation just in case, and while I may think many things about the current Governing Council at the ECB, a pack of fools I do not think they are. It is also worth remembering that with the present occupant of the Bank of Spain governorship it is very important that you read the fine print in what he says, since while he definitely tells the truth, and nothing but the truth, he doesn't always tell "the whole" truth, as when he said that Spanish banks had no exposure to off-balance-sheet SIV-type securitisation (which it didn't), which is not the same thing as saying Spanish banks have no exposure to potentially toxic instruments, since as we are now seeing they do, and I'm sure he was aware of that at the time. Prudently, he was simply keeping his fingers crossed, and saying what he had to say. So we should be aware that Señor Ordoñez is a very astute customer, which Joaquin Almunia evidently isn't, and the difference between the two is apparent in the way the former has to rapidly jump up out of his foxhole in an attempt to undo the damage potentially done by the latter's rather eyebrow raising "faux-pas". And just to ram the matter home, I will leave you with an earlier effort on the part of our much beloved Economy and Finance Commissioner to win for himself the acollade of economic illiterate of the year. The European Union's Economic and Monetary Affairs Commissioner Joaquin Almunia said on Monday (27 October) that while lower financing costs were needed interest rates should not fall to negative levels in real terms. 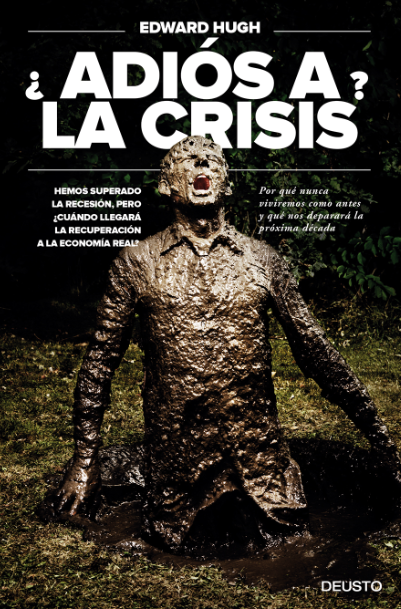 "At this moment, it would be good for the cost of financing to go down," Almunia told a live Internet chat with readers of Spanish newspaper El Pais (www.elpais.com), adding: "We shouldn't go back to a situation in which real interest rates are negative, as we know from experience that this leads to excess indebtedness, low perception of risk and new bubbles which always end by blowing up in our faces." Almunia said it was hard to say how long the present bout of financial turbulence would last but he thought the uncertainty plaguing markets should have cleared with a year. Essentially two things are being confused here. Negative interest rates (such as those Spain had between 2002 and 2006, you know, the ones that lead to the current crisis) are highly undesireable during the upswing in a business cycle, since you are simply giving more stimulus to economies which are already stretched to capacity - and negative rates may thus produce "bubbles", as they obviously did in both Ireland and Spain - but they are of course highly desireable during a downturn, and especially during recessions, since they can stimulate slumping economies. And of course, we are all currently heading into one of the most important recessions since WWII, or hadn't our "machine-reader" commissioner noticed? I mean, as I say, basically the man is a total economic illiterate, and indeed his policy pronouncements more often than not lead me to feel what the Spanish would call "verguenza ajena" for any club of economists who would entertain him as a member, or indeed group of Commissioners who get stuck with him fielding the economics portfolio. And what better proof of all of this could there be? 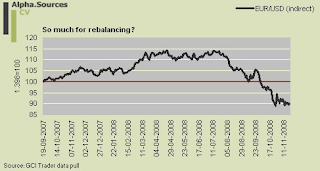 Well, take a sneak peak at the above chart, and you will see that Spain once more had negative interest rates after the end of 2007 - ie at just the time when Almunia was speaking - as, of course, the textbook recommends it should. As I said, a complete pack of fools is something the ECB Governing Council aren't. But, and here we come full circle, as inflation is falling interest rates get near to turning positive again (once more giving Spain a dose of "restrictive" monetary policy) and the problem is going to be how we maintain negative rates as Spain enters deflation. We had all better join Fernandez Ordoñez in keeping our fingers crossed and hope that our ECB Council Members prove to be just as inventive as Messrs Benanke and Kohn at the Federal Reserve, and equally astute as those Honourable Gentlemen over at the Bank of Japan.